I stopped using toothpaste and instead have been brushing with baking soda for the past 2 months. Before I switched over, I tried to do as much research as possible about the affects of baking soda have on teeth and gum. The evidence was overwhelming positive. I then researched on how to make my own baking soda toothpaste. There were many baking soda toothpaste recipes online. I didn't follow any exact recipes because I learned that you need only a few key ingredients and the rest was for taste. 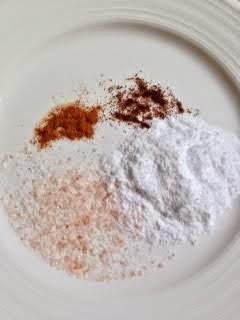 Ground cinnamon, ground clove, sea salt, and nutmeg are the key ingredients that contain minerals for healthy gum. I made my mix using these ingredients. As we age, our gum and teeth age as well. Of course they do. Did you know that? I certainly didn't! I noticed my gum started to recede slightly in 2 areas and my teeth looked like they were not as thick as before. I learned that toothpaste contains way too many chemicals that alter the composition of the teeth enamel. This altered state does not allow our teeth to naturally remineralize. Our teeth have the amazing ability to remineralize but they can't because of all the chemicals especially fluoride from our toothpaste. The use of fluoride in our water and toothpaste has been widely debated and researched. I don't want to get into the scientific part here but I could tell you the changes in my teeth and gum health after I stopped using toothpaste. The first day I brushed my teeth with baking soda, I almost gave up. My mouth didn't feel clean and my gum was scratched. I didn't like the way my mouth tasted or felt. I went online and googled about scratched gum from using baking soda. I read some people experienced the same thing. Luckily, I didn't just give up thinking that baking soda was too abrasive. I discovered that I was brushing too hard. When we brush with toothpaste, the foam acts as a buffer so we actually have to brush harder. When you brush with baking soda and water, the brush bristles are directly touching your gum and teeth. There's no foam that acts as a buffer and I learned I was simply brushing too hard which was really bad for my gum. No wonder it started to recede. The baking soda did not scratch my teeth; it was my brushing that scratched it. One surprising fact that I learned was baking soda is actually less abrasive than toothpaste. Who knew? You can take a look at the radioactive dentin abrasiveness index of toothpastes and see where your brand of toothpaste stand. Aside from using baking soda to brush my teeth, I am also using the Bass BrushingTechnique. It's quite hard to explain. I suggest you watch the video to get a better understanding. The Bass brushing technique basically retrains you to brush with much smaller strokes. You remove plaque and tartar better using this technique. Trust me. The conventional way of brushing doesn't do a great job of cleaning your teeth. If you don't brush well, bacteria that sits around eventually will give you gum problems. Healthy teeth and gum starts from proper brushing! I don't measure when I prepare my baking soda mix. 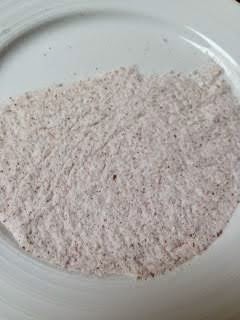 I put about 3 tablespoons of baking soda, a couple dashes of ground cinnamon, cloves, nutmeg, and 1 teaspoon of sea salt. 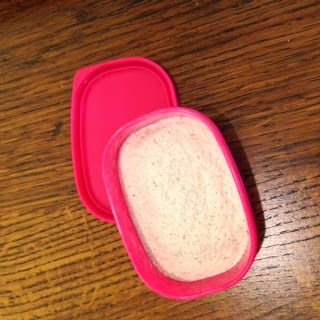 I used to use pink Himalayas sea salt as pictured but I find the salt takes too long to dissolve. I am using white sea salt now. Sea salt contains minerals and is alkalizing so you should use sea salt and not regular table salt which is heavily processed with virtually all minerals and elements removed. I put my baking soda mix in a container and scoop half a teaspoon out to brush with. I also dilute my mix with some water. I then dip my toothbrush in the cup for each quadrant I brush. My 9 year old also brushes her teeth with baking soda. She had her semi-annual checkup just 3 weeks after she switched over and the dentist was AMAZED at how clean her teeth were. She didn't need to scrap as hard as before and she was praising what a wonderful job my little one done. My dental check up is coming up next week and I will keep you posted on how it turned out.